Here is an Easy way to make lot of money by promoting your favorite affiliate programs on the Internet. What we provide you is an easy to use Software Utility that will make you Hundreds of Dollars instead of few cents like Google AdsenseT pays. 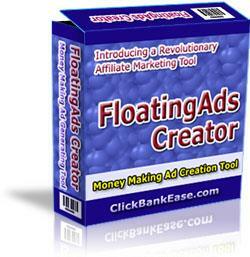 FloatingAds Creator gives you a new way to make a substantial amount of money from Affiliate Programs. Get Your Own Money Making Automated Ad System With Master Resale Rights! What are Floating Ads ? Floating Ads are basically Cash Generating Ads looks similar to Google's Adsense but with more Sense, 'floating' on your web page. These Ads re-position itself whenever the page is scrolled. That means, when your website visitor scroll up and down the page, this ads will not go up and down with other contents of the page. These Ads will be there floating on a visible portion to get maximum exposure to the public. Visitors will see Highly Targeted (content based) Randomly selected Ads in your Website on every visit. You can control the whole system by adding a single line of code in your site Generated by FloatingAd Creator. Just Copy and paste the above code in-between <head> </head> tags of your site and then, load the page in your browser. You can see how it works! In addition to the above benefits, your Floating Ads will work as a Viral Marketing Tool. When people see your FloatingAds, they will also notice the links at the bottom saying "Powered by FloatingAds Creator", and when they click on that link, they will be forwarded to your sales page. Since you get Master Resale Rights to this package, you will get 100% of the Sales coming from those link. One Sale will give your investment back !! FloatingAds Script - You need to Install this script only once - it takes only less than 5 minutes as specified in our step-by-step user manual. A Searchable Database of Thousand of ClickBank(TM) Merchants products in 108 Categories PLUS products from other Merchants like Internet Marketing Center, Sitesell, etc. and monthly recurring products like BuyingWeb Business, NetBreakthroughs, Internet Marketing Interviews etc. A simple utility to customize the whole database with your Affiliate ID on a single click! Step-by-Step User Manual in PDF format. Free Updates - You will get all new versions without any additional charges. You don't have to worry about Google's Strict policy any more. You have your own Automated Ad System in hand! 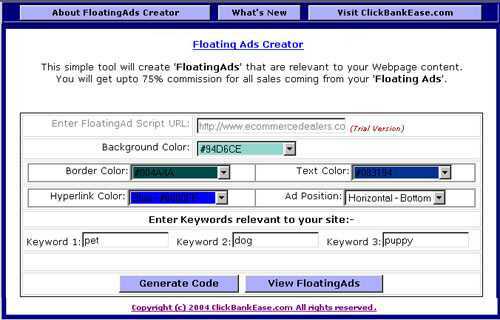 You get Easy-to-use FloatingAds Creator Tool. You can create FloatingAds on a mouse click. Just one line of generated code into your website and the Script will do the rest. New Ads on Every Visit - Your website visitor will see fresh Ads on each visit. Ads will open a new window, so your customers will stay on your site! Hack-Proof Script - Nobody can see the actual source code by verifying your HTML code. Only content-relevant, highly targeted FloatingAds appears. You can place FloatingAds in any number of pages/sites. The updated database will be provided regularly so the best programs always appear in your FloatingAds. You get Full Master Resale Rights - You will get back your Investment on a single Sale! Legal Notice: ClickBank(TM) is Copyrighted and owned by Keynetics Inc., a Delaware corporation. We are NOT associated with ClickBank/Keynetics Inc. in any way. All other Trademarks, Brand Names, Website Names and Links mentioned are copyrighted by their respective owners. Development of this Free Tool is bona fide and the developer and distributor has no intention whatsoever to convey any idea affecting the reputation of any person or business enterprise. This Software and supported files are distributed with the understanding that we are not engaged in rendering technical, legal, accounting or other professional advice. In no event will the developer or distributor be liable for any direct, indirect, incidental, consequential or other loss or damage arising out of the use of this Software by any person, regardless of whether or not informed of the possibility of damages in advance.